I was pretty down on a lot of the art I saw at HFAF this year. But I did see art I liked. The thing is that good art takes time. It requires contemplation. And an art fair is an environment antithetical to that. The bad art tends to be unsubtle. It screams at you from the walls. It's like a spotlight shining on your face. It makes it hard to see anything else. But I made the effort. I spent five hours going from booth from booth, trying my best to screen out the glare from the loud, bad art to see what I could see that was good. And the good is the subject of this post. One note--I liked a lot of local art. Does this mean that I think local art is better than art from other places (on average)? That I am a chauvinist for art produced in Houston and vicinity? In my defense, I think the reason that I favored the local is because when I see a painting be, say, Geoff Hippenstiel, I am not seeing that painting in isolation. I am seeing the latest stage of a painter whose work I have been observing for a while now. I don't have that privilege for most out-of-town artists. If I am perplexed by what they are doing, I don't have any idea what their concerns as an artist are or how they reached this point. If I was living in Chicago or Seattle, I'd have similar experiences with their local artists. Familiarity breeds understanding and that ironically leads to what is effectively a local bias. You'll also see that I like a lot of old things--Latin American Constructivists pieces (well represented at HFAF), abstract expressionist work, and surrealist objets. And there is a lot of photography on my list. I've tried to group similar works together, as if I were curating an exhibit. Hopefully that will help reduce the noise of such divergent work. As I said in my post on the art I hate, your mileage may vary. This cheesy studio portrait by Melitón Rodríguez from over a hundred years ago is made unexpectedly surreal because of the the rifles held by the young women. One can't look at this piece by Cannon Bernáldez and not think of the Wicked Witch of the East in The Wizard of Oz. 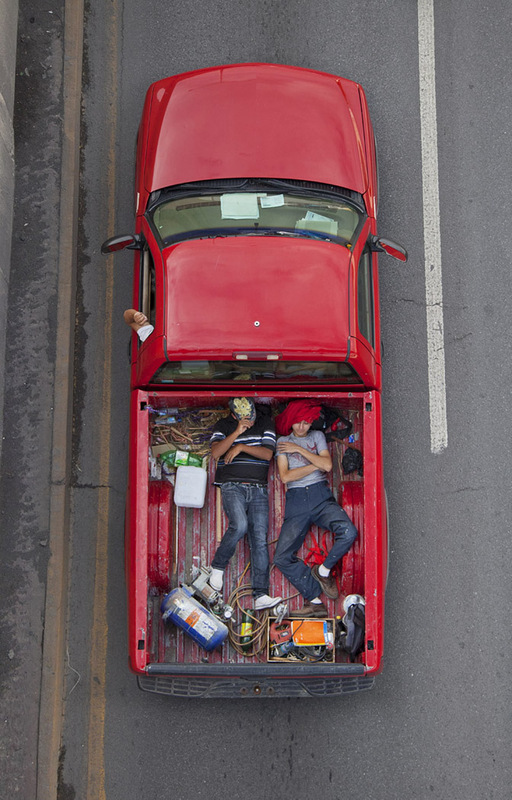 I imagined Alejandro Cartagena sitting on an overpass, camera ready, for many days to get this series of photographs. I found the series quite powerful and timely. For me, it's the two tangent ellipses and the small green stripes separating the pink and orange stripes that make this piece by Aaron Parazette work. And the concentric circles radiating out from the tangent point. Dion Johnson's shaped canvas and overlapping colors initially struck me as a bit chaotic, but spending some time with it leads me to believe that the geometries here are no less deliberate than those in Aaron Parazette's painting. The diamond dust in Joseph Cohen's works at Avis Frank gave these monochromatic and bichromatic paintings a rather unearthly luxe flavor. I was struck by the similarity between Cathy Choi's work and Joseph Cohen's. Lots of the work at Margaret Thatcher Projects featured artists working in brightly colored resin or plastics, as with this piece by Heidi Spector. The booth had a playful feel. I think people were quite taken with Omar Chacon's paintings last year, so Margaret Thatcher Projects brought back more Chacon pieces for an encore. Luis Cruz Azaceta, Urban Jungle, 2011, serigraph, 36" x 41"
Of course, for intense color, silk screen is a venerable, low-tech medium, as Luis Cruz Azaceta demonstrates. Al Souza had this brightly colored puzzle piece in the fair. I always wonder with his puzzle pieces how quickly the colors fade, given that puzzles are printed with cheap inks on offset litho presses. It was astonishing to see this early constructivist work by Joaquin Torres Garcia at the fair. 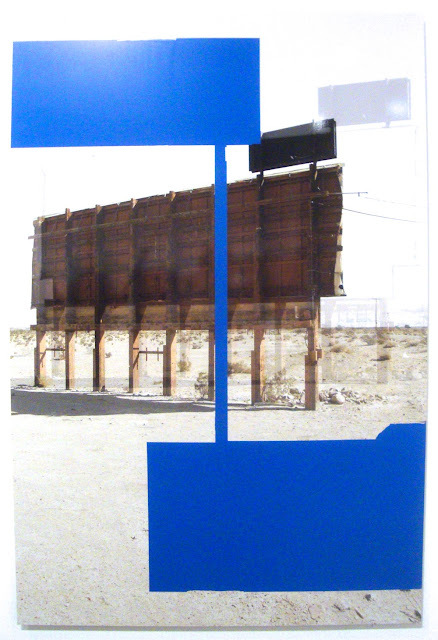 But Latin American constructivism seemed to be a theme this year. Like this angular collage by Lolo Soldevilla. I especially liked this wood contruction by Juan Mele. And North America's abstractionists were not left out, as with this handsome Theodoros Stamos. But my favorite abstract expressionist painting in the show was this untitled piece by Norman Bluhm. And there was a beautiful suite of tiny etchings by Robert Motherwell. Francisco Larios creates a more modern abstraction with Doppelganager Delirium where recognizable graphic elements are mixed with a painterly textured surface. It makes me think a little of Lari Pittman. What jumped out at me in this painting by Geoff Hippenstiel was the black bar--it felt like a new element, something I hadn't seen in his work before. 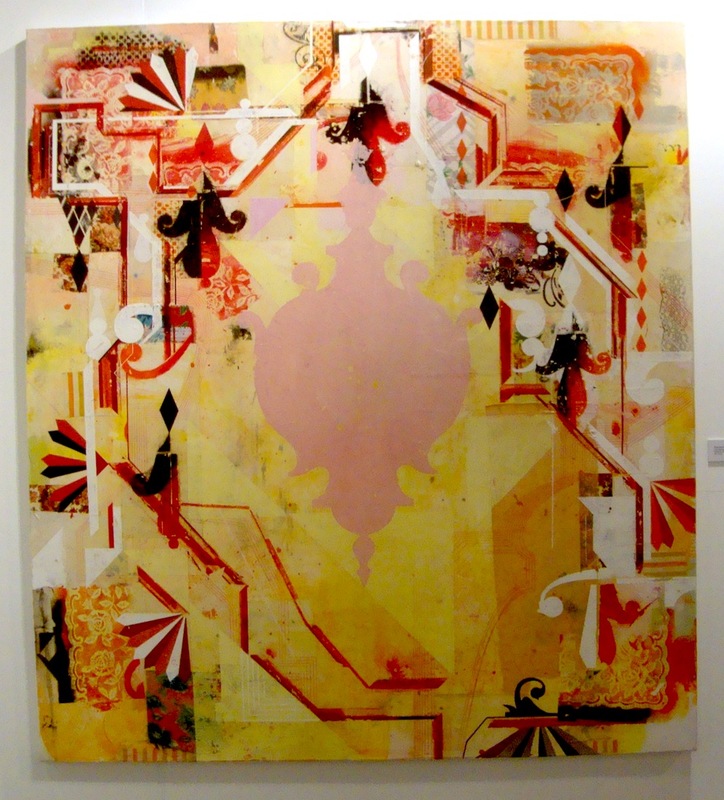 Antonio Murado had work in two different galleries at the fair, and I was struck by all of it. Unlike Hippenstiel's thick impasto, Murado works with very thinned-down paint, creating transparent layers which he employs to various ends. The effect is subtle and sneaks up on you--therefore making it difficult work to see at an art fair. In addition to this delightful Alexander Calder spoon, Schroeder Romero & Shredder had a selection of gorgeous Man Ray photographs. Pieces like No. 4 Kopie by Annette Sauermann, with its subtle shades of grey, seemed destined to be overlooked in the visual cacophony of the art fair. Likewise the inkwash calligraphy of Retna. I was quite taken by Carol Young's ceramic installation, which suggested themes of memory and age. It felt deliciously out of place in this venue with so much concentration on "the new." I was reminded a little of Ilya Kabokov's installation School No. 6 at Marfa. Johannes Girardoni also approaches memory in his work-or specifically forgetting. Sarah Frantz likewise deals with forgetting or eliminating. Young, Girardoni and Franz all showed work that felt mature and wise, in contrast to some of the more typical art fair work which is brash (which is not a fault) and/or imbecilic. The octopus lost, I guess. John Adelman had a great selection of paintings at Darke Gallery. These works are the result of an obsessive process, and it is the process that interests Adelman, but the results are quite beautiful. Not surprisingly, some of the best work at HFAH was at the CORE Program exhibit. 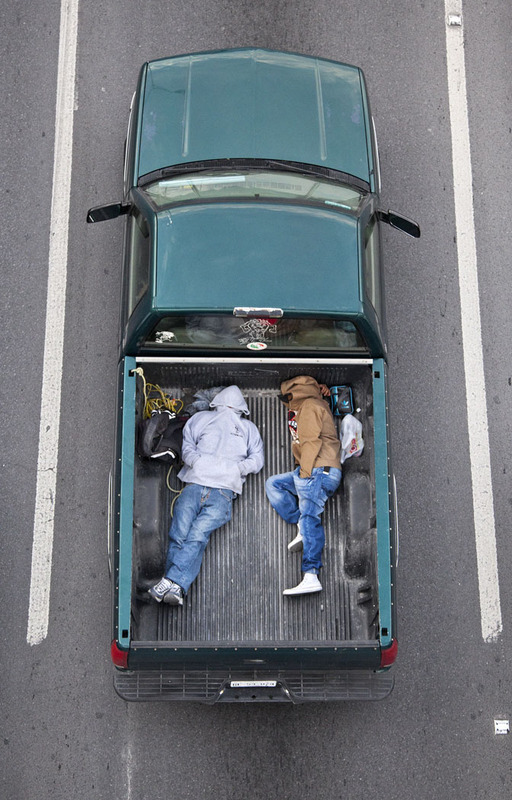 Neighbors by Leandro Erlich had a feeling of loneliness and paranoia. I was reminded of Edward and Nancy Kieholz's Pedicord Apartments or even certain Edward Hopper paintings. 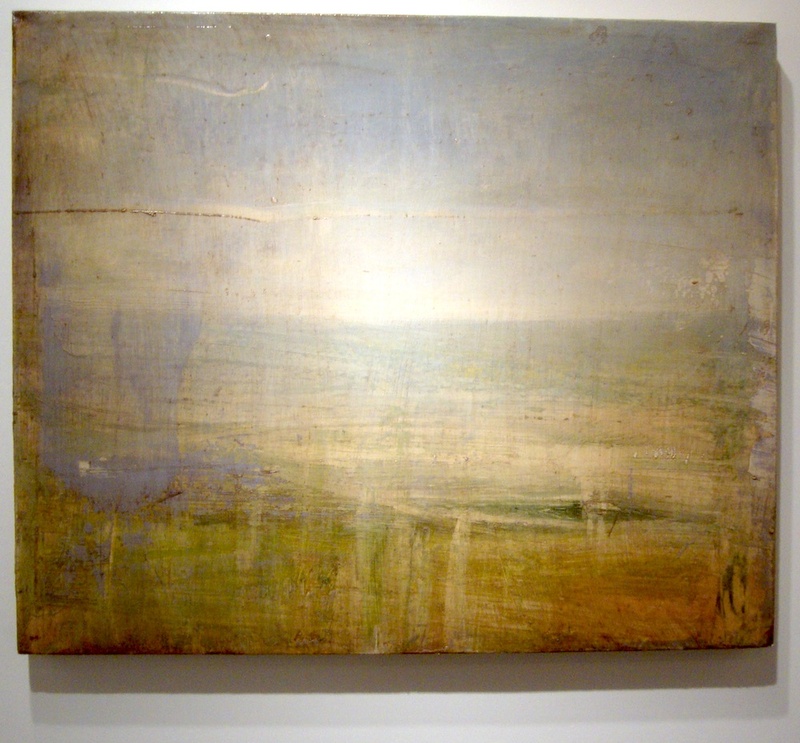 Mark Greenwalt has a great show up right now at Hooks-Epstein Gallery. There is something slightly disturbing about Richard Colman's painting at New Image Art. Trying to understand what is being depicted (beheadings?) within this setting that seems simultaneously ancient and science-fictional. The work grabbed my attention and held it. This is the first time I've seen Robert Pruitt depict a group scene (as opposed to an individual portrait). The two viewers (connoisseurs? casual art fans?) look at the sculpture (or ritual object) being shown by the third woman. In a way, it could be a depiction of an episode at an art fair! Rodolfo de Florencia caught my eye with this genuinely bizarre image of auto-cannibalism. The richness of the painting combined with its utter eccentricity were what appealed to me so much about it. There were several Trenton Doyle Hancock pieces at the fair, but this one, with its skein of roots and words, appealed to me the most. Wayne White is always welcome. As is William Betts. This was one of his pieces where a photographic image is placed into a mirror by drilling out tiny holes and filling them with acrylic paint (presumably some computer-controlled machine actually does this--I don't see how human hands could accomplish it). Because it's an image on a mirror's surface, it is quite difficult to photograph--an effect that Betts may have deliberately sought.